No ordinary tyre guarantees to be absolute puncture free, but improvements in technology have gone a long way to reducing your chances of puncturing. For the average rider and commuter, buying a puncture resistant tyre is probably one of best upgrades to make. Highly puncture resistant tyres usually have a trade off of greater weight and higher rolling resistance (i.e. slower) but the slight decline in speed is well worth the greater peace of mind that comes from having less punctures. These are some of the puncture resistant tyres that I have used over the years. The tyre feels pretty tough – it is a very robust 60 TPI (Threads per inch) – which is very different feel to the racing tyres of 300TPI. It’s toughness makes it very resistant to small scratches and glass cuts. It gives more confidence for commuting on a rought canal path. A minor downside of its toughness is that it’s a bit awkward putting on rim with fingers, but then you rarely have to change a puncture. It claims to be designed for low rolling resistance; but, in practice it feels heavy – it is is noticeably slower than a Grand Prix 4000. But, I am quite happy using it on my commuting bike and have also added to the rear wheel on my winter training bike, at various times. I have been using them for over seven years (5 days a week) During that period I have had three punctures and one was a 6 inch nail. Roughly speaking its a puncture rate of 3 / 9,000 miles or 1 per 3,000 miles. It’s also pretty hard wearing, I get maybe 3,000 miles on rear and 5,000 miles on front, which is a long time for a commuting bike. At £30, overall this is a very good value tyre which offers excellent puncture resistance. It really is a good investment and one of my favourite. This has one of the strongest puncture resistance and is almost impregnable. Pictures show you can put a drawing tack in middle and it doesn’t penetrate to the inner tube. It comes with an extra layer of rubber which resists even a drawing pin. It is quite heavy at between 600 -900 grams, but, this is because of the thickness of the rubber. If you really want a very strong puncture proof tyre, this has one of thickest layers of protection. It has a heavier rolling resistance (but doesn’t feel totally dead), but you won’t be buying it so you can be light and fast. I have only had one. I did approx 4,000 miles without a puncture (I can’t be certain of mileage, but it was on a commuting bike for a good 18 months. It is geared more towards the hybrid bike market. 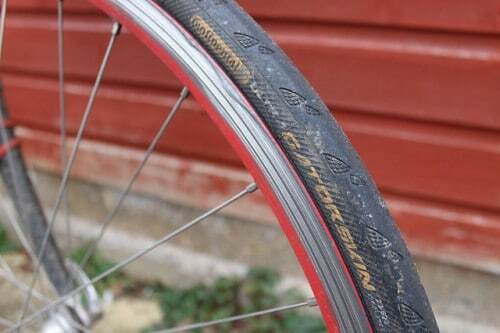 At £30 for a tyre, it is a good investment in time saved and cost of new inner tubes. This is the road bike version of the Schwalbe Marathon. It is slightly lighter than the previous tyre – but still heavier than your average tyre. 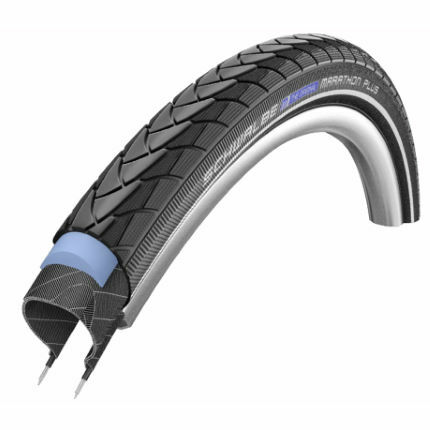 It offers very good puncture protection with only slight decline in rolling resistance. Despite the marketers claim, you definitely wouldn’t race on this as the extra weight would be a handicap, but if you are sick of getting punctures on your training bike this is one of best protection you can get. Good for training bike, very low ratio of punctures. Over the years, I have done many thousands of miles with Gatorskins on my winter training bike. The rate of puncture is pretty low – approx 1 to every 2,000 miles. In terms of rolling resistance Gatorksins, like other Continental tyres, are pretty good. You don’t feel the same kind of handicap with a slightly heavier Durano or Armadillo. Continental Four Seasons, weighs 250grams, but is the best Continental Tyre for resisting cuts and punctures. It has two vectran layers, plus a special tyre compound to prevent splits in the sidewall. 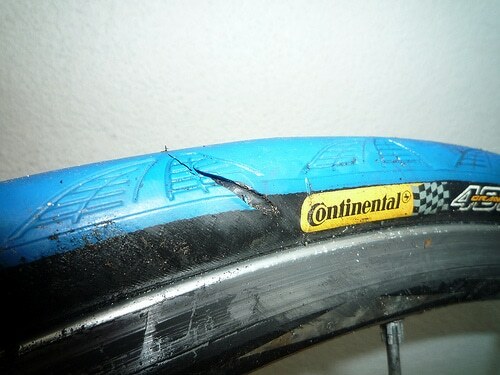 The older Continental 4000 were prone to sidewall splits, and there puncture resistance was not great. But, this sidewall split was five years ago, recent models don’t seem to suffer from this problem, and the tyre has become better. In the past year, I have had a tubeless Hutchinson Atom tubeless tyre on the rear of my Trek Madone. I have filled with self-healing slime. I have not encountered any rear wheel punctures during the past 18 months. 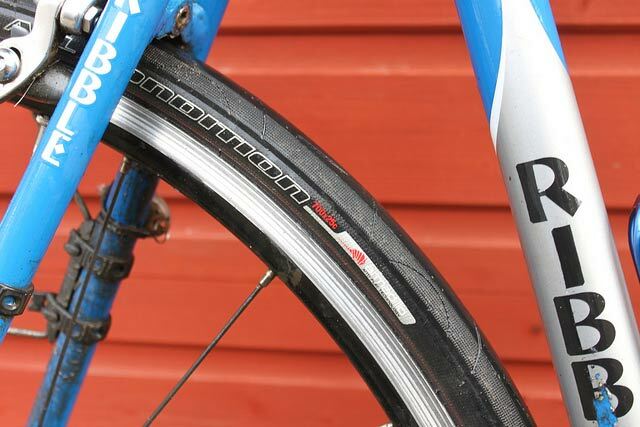 Tubeless tyres are not subject to pinch flats. If you do get a small puncture, the self-healing liquid should fill the hole and make the tyre stay pumped up. 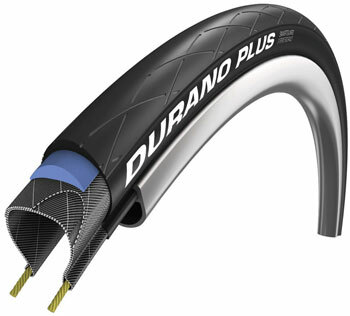 Tubeless are harder work to install, but they offer a very comprehensive option for protecting against punctures. The only absolutely puncture free tyres are those that are completely solid. Manufacturers claim it lasts at least 6,000 miles. Being solid, punctures are not possible, there is nothing to deflate. At under £50, it is competitively priced. In the sense that it is a small premium compared to the cost of of repairing punctures. The claimed mileage seems actually conservative. Would I want to try one? If anyone has good experiences with puncture free tyres and knows where you can get one for 700*25, I would be interested in hearing, you can leave a comment below. It’s not just about the tyre. The most important thing is to put tyre on without catching inner tube between rim and tyre. I’ve used Marathon Plus for many yeas now, mainly commuting (mostly along minor country roads, some light off-road along beaten tracks), and I’ve had a puncture every few (3 to 5) thousand miles; and then only in the off-road bits. Usually that’s a sign that the tyre itself is wearing out (e.g. when a chunk of flint breaks the tyre around one of the elements of the tread pattern near the side-wall); though I have had a puncture through a new-ish tyre but that took a Y-shaped bit of hawthorn with a long thorn sticking out in a perfect caltrop design in amongst the debris of hedge-trimming along the verges. A budget, relatively light choice – Specialized Espoir Sport 25mm tyres (not the more expensive Elites) can be picked up for £15. In 20 months and 12,000km of riding through all seasons in the UK and even the odd bit of gravel I’ve not had one puncture and they’re still going strong. All I’ve done is keep them topped up to 85-100 psi, depending on conditions, and it seems the featured “Double Black Belt” protection really does work. I’ve used the more expensive Armadillos in the past too but, while they were good, they didn’t last nearly as long and are somewhat heavier too. I’ve had Marathons on for two years now. Excellent tyre, good grip. I’ve rotated them as well so that wear is slightly more even. Roads in rural mid wales always seem to have the hedges brushed. Typical, went out for a ride a few hours after posting this. Puncture on a Bontrager R4 tyre. Read this article on Monday night and thought about putting my proper winter tyres on but didnt get round to it. Hey presto – 2 flats during commute yesterday! I have long been a fan of the Specialized Armadillos (as you have reviewed) for trouble free winter riding but you do pay a price in road feel and rolling resistance. There is a newer improved version which addresses some of the drawbacks – All-Condition Armadillo Elite. It is a folding tyre with 120tpi, certainly rolls better and has more feel, though still no racing tyre. The rubber is softer and maybe surface cuts a little easier but no punctures so far. I have been running 28c slightly soft and the comfort and wet grip is superb. Price c£35, also a wired version £30. tried 700×32 Bontrager Hardshell’s not long ago, but them on front and back, the front developed a side split at the bead with nearly full tread remaining. There’s definitely under 100 miles on that one. The rear lasted about a year and had noticable wear on the tread but it had to be taken off for exactly the same problem. It too developed a 3cm tear right along the wire bead at the rim. i will not be buying any more of them. I’ve had excellent experiences with specialized armadillo all seasons after about 5 pairs. Not a single sidewall rip or bead separation problem. My first pair had the tread pattern in your photo, They now have a more aggressive pattern with more V grooves, almost all were worn down to the threads before getting changed out. the sidewalls and bead remained very strong and stiff to the last day. On another bike have a pair of gator ultraskins (folding type, non-wire bead), and have had no problems with them after about a year of occasional riding. I wouldn’t recommend gatorskins. I used them for a couple of years without trouble. Fitted a new pair 3 months ago and am averaging a puncture a week with 60 miles of city commuting. I’ll have to bin them and will try marathon plus next. Living in the northern part of Northumberland we have a multitude of fantastic cycling roads (just avoid the potholes! ), the downside is the are nearly all ‘hedge lined’! Hawthorn, Blackthorn, Firethorn etc, if it has a thorn you’ll find it along our lanes! For years I’ve rode Schwalbe Luganos (700c25’s) for leisure and sportives, I think I’ve had 3 punctures, all missed the kevlar! The last was the day before changing to Marathon’s for winter use, part of one route is a gravel path and Lugano’s are not great on it, the Marathon’s have far better manners on gravel and wet roads. Both are very good strong tyres, don’t get any pressure issues, in fact on one sportive the chain jumped and locked the wheel taking the rubber off down to the kevlar! No marks on the kevlar, choice was change the tyre ( I have a folder with me) or leave it! 30 miles later and the finish it had got me back with no issues, in fact I didn’t notice any difference! Fitted a new tyre the next week (another Lugano), the ‘bald’ one is used on the turbo! A riding pal has Gatorskins (700c28’s) come October he carries extra patches and an extra tube, October is hedge cutting time and the roads are strewn with the debris! One ride he had 3 punctures which were fixed on route, the next day he found another 4! Heard similar from others on the same tyre too, I’ll stick with Schwalbe thanks!